This is my tenth year participating in National Novel Writing Month. This year I decided to craft a brand new stand-alone novel that gives quite a bit of background to both of my fiction series. The book is titled Salt (for the moment), and my goal is 75,000 words by Thanksgiving. I’m only at 7,467 right now, but I’ll get ahead of the curve this weekend (hopefully). The main point of the novel is to tell the back story to the main antagonist – Legion – of my two fiction series – Black Earth and Expired Reality. While Legion is actually referred to as an alien species within both series, Salt (my NaNo novel) tells the story of how Legion used to be one man who became corrupted by malice and lack of identity. 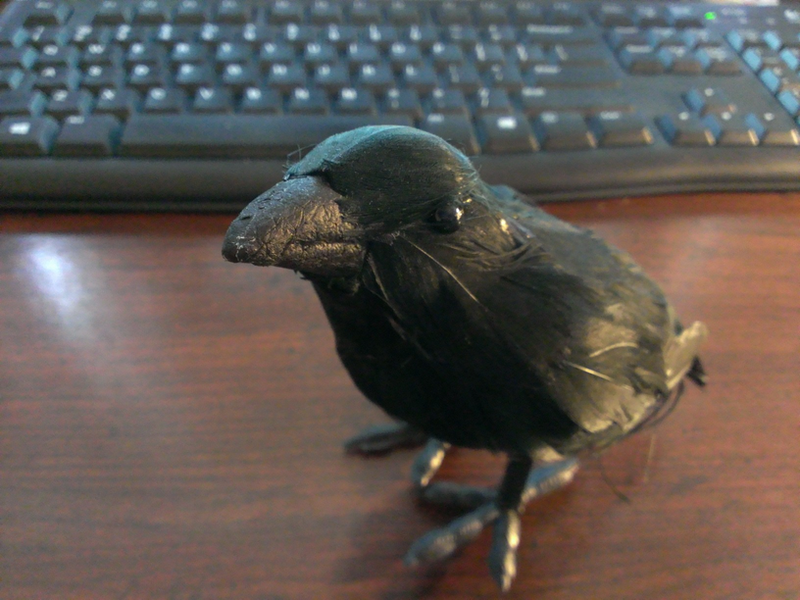 This is a bird I picked up in the local crafts store a few weeks ago. He’s going to be a part of the cover design. Isn’t he cute? And dark? And a little creepy? He sits on my desk and chases the Writer’s Block away. My plan is to release the book sometime in late Spring 2015. Alright, I have to get back to writing. I have a lot to catch up on today. For those of you participating in NaNoWriMo, what are your stories about, and what is your word count goal? Do you stick to 50,000 words, or do you try and challenge yourself further? Leave me a note and let me know. Good luck this year. I’m doing it too, and for fun I put the genre of it to my blog readers. Let’s just say I’m probably failing hard at writing magical realism. Glad to hear you’re participating this year! Magical realism sounds like a decent challenge.